Soccer players may run between 5 and 7 miles during a typical 90-minute match. So their footwear must be comfortable and efficient. 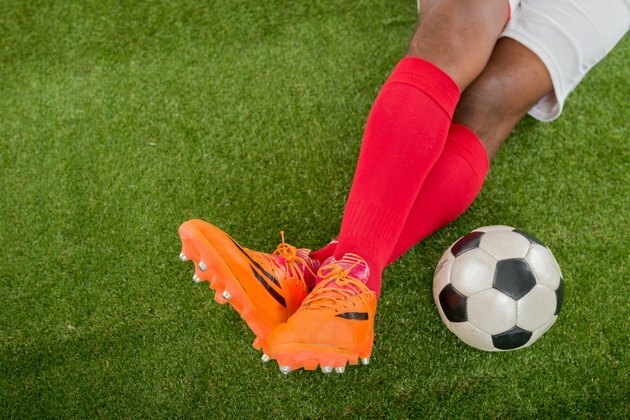 Soccer players must identify the playing surface to select the proper cleat lest they become stuck in mud or have their long studs slide across the too-firm ground. SG and HG refer to soft ground and hard ground cleats, two of several styles of cleat designed for specific surfaces. Soft ground cleats are the primary cleat used on soft, slippery natural surfaces such as wet grass or mud. Almost all models will have removable studs that are between 1/2 to 3/5 inches in length. The removable studs allow the players to adjust their length depending on how slippery the conditions are. Players can chose between metal or plastic. Soft ground cleats will have studs that are spaced widely apart to prevent mud from clumping. Most models have two to four studs under the heel and four studs under the ball of the foot. When playing on a well-maintained grass field, firm ground cleats are the appropriate choice of footwear. Firm ground cleats are the most universal cleat and make an excellent choice as a first cleat. Firm ground cleats have molded cleats with plastic studs or blades depending on player preference. These shoes have between 10 to 14 individual cleats in locations critical for pivoting and traction. Hard ground cleats provide players with traction on dry, hard surfaces such as on a dirt field or synthetic turf surface. These cleats are most useful in the hot summer months when fields may not be adequately watered. Hard ground cleats have molded round plastic studs that are much shorter and numerous than firm ground cleats. The studs on these cleats sit on top of the playing surface to provide traction and will not dig into the ground. Indoor shoes lack studs or blades. They have a simple sneaker-like tread. These shoes give players the look and feel of a soccer shoe while they play on indoor surfaces such as in a gym or on asphalt. Often these cleats will retain a brand’s design including special shoelaces or kicking surfaces built into the fabric of the shoe. What Type of Soccer Shoe Should Be Worn on Turf?